Up to 2004,there were two cafe's in Noia that specialised in offering a range of cakes and pasteries with a coffee, tea or hot chocolate. The most popular one was at the entrance to the medieval area and although it is pretty good, its popularity is based primarily on its heavily trafficked location. It now sees less custom. 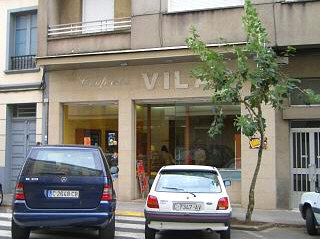 In 2005, a further two similar establishents opened and one of them (Vilas) opened a second cafe in 2009. Additionally, Noia's most popular cake shop, Dominga, also expanded to include a very stylish art deco cafe within the new larger shop in 2008. Here we will tell you what we think of these establishments. The first really good cafe of this type is on a road that leads out of Noia (to Santiago) and its address is: "Avda. Galicia, 40", and it is just as close to Noia's main square as the popular one described above - and the cakes and surroundings are far better. In order to reach it you simply cross the main road between the main square (alameda) and the rest of town and then turn left on this same road (Avda. Galicia) and it is number 40. 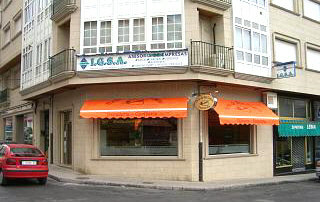 It is called "Confiteria VILAS" and the picture above shows the shop front. When you enter this cafe it appears, at first, to be a cake shop and you will be confronted by row upon row of small, bite sized cakes under glass. If you then look to the right of this display you will see the attractive and modern cafe (yes the best bits of Noia are not all quaint and old fashioned). Unfortunately, despite that fact that this cafe is always "choc-a bloc" with cakes, I some how managed to take this photo (above) on the one occasion when it was nearly empty, but I'm sure you can get a good idea of what it normally looks like. To the right you can see part of the cafe interior with the "mini" cakes we ordered on a tray with a doyley (left) and a larger cake that I could not resist to the right. As I remember the cost of these 8 small and one large cakes, plus a coffee and flavoured tea was between 5 and 6 euros (about 4 pounds or 7 US dollars). In 2009 Vilas opened a second cafe - just off the end of the alameda and at the junction with the road that leads off down the coast. This cafe is good for people watching and, unlike the original, it is more of a cafe than a cake shop with a small cafe to the rear. Inside this cafe is ultra modern with stylish adjustable stools or minimalist chairs and it also has tables on the footpath (side walk). 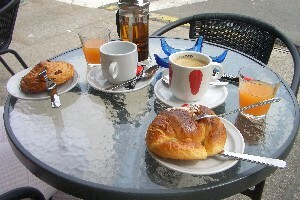 We also reckon that it offers the best value breakfast around with a deal that lets you have an espresso coffee or tea with a glass of fruit juice and a choice of pastry - all for 2 euros per person. 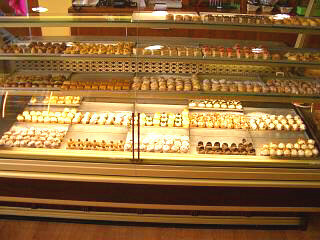 The pastries are large and range from croissants to Danish pastries (the selection varies based up on the day and the time that you arrive). In addition to the two cake cafe's already mentioned, a further two have opened this year, one of which we would recommend. It is called "Panaderia Confiteria" and is opposite "Mama Mias" pizza restaurant at the back of Noia's main piazza and is pictured left. It opened in May or June 2005. This cafe has several things going for it. Firstly, it has fantastic cakes, excellent coffee, plus a variety of specialist coffees and hot chocolates. 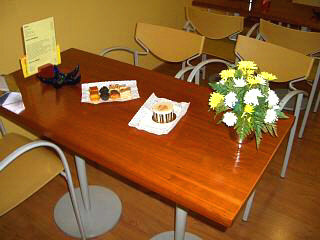 Secondly, the cost of a "real" coffee, or pot of tea, is only one Euro and you also get a piece of cake to go with it. Thirdly, it is air conditioned (a rarety in Noia). Fourthly, everything is baked fresh by the owners, one of whom runs the cafes (they have two) and the other who makes the cakes, breads etc. I can go on continuously, but they also make ice creams and are generally very nice people. Right, the total cost of everything on this table is only 2 Euros, how's that for value. The other new cafe is just above Panaderia Confiteria and they sold both us, and my wife's parents, stale bread on seperate occasions. 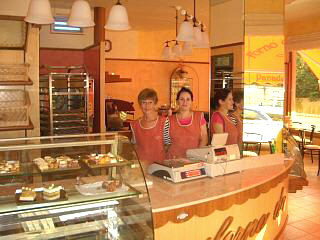 Left, the inside of "San Cosme Panaderia Confiteria"and two of the ladies who work in it. We noted that in 2009 this cafe had definately dropped its standards and was handing out mini croissants and even pieces of french stick with its coffees. As a result we decided to go else where. A quick word on Dominga, for which I have no photo (sorry). This was, and still is, a very busy cake shop, but it now has a side cafe too. 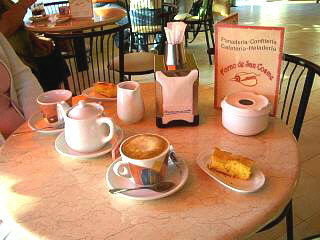 The cafe is stylish and is located just over the road from the alameda. The drinks are good (although slightly more pricey than the other cafes in Noia) and the lady who owns it is very pleasant and, I suspect, quite rich by now. It is definately worth a visit. A final note (2014). The mini cakes referred to above to seem to have been largely replace by little biscuits over the last three or four years, each with different flavours or toppings. Trends in cakes seem to change in Spain and Galicia!